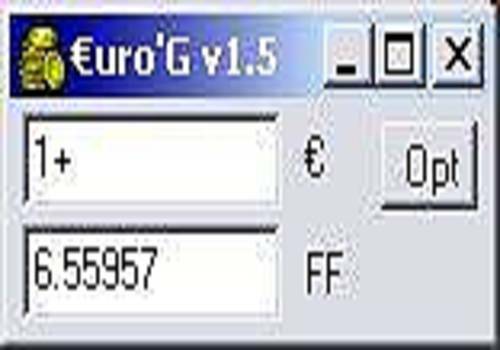 Fast converter from euro to a currency (European or not) and vice versa - direct conversion when entering, - calculator function 4 operations (+,-,/,*,%) - Fixed currencies DM, ESC, £IR, PTA, FF, FB, FLux, FLux, FL, MF, SCH, DR - A modifiable currency (ex: $US or YEN....) - accepts Copy/Paste - Small screen size (preview at 1 scale) - Small disk space (235 KB) - Switch from one currency to another in 2 operations (x FF -> y € <===> z DM for example) - New v1.5 (19/08/2003) : (+) a modifiable currency (such as the dollar for example) and memorization of the value (+) addition of the operation % (percentage) : 100+5% (=105) / 100*50% (=50) (.) Correction of a bug during fast entry (.) Correction of a display bug on the currency label - New v1.4 (07/07/2003) : (+) Added a calculator function (type 0.5+0.5 then[Enter] or another +-/* operation in the € field, displays 6.55957 in the FF field) (.) Fixed an incompatibility bug with Windows 98. Software that allows you to work with exchange rates set by the National Bank of Ukraine, the Central Bank of the Russian Federation, the Central Bank of the Republic of Belarus. In the form of a calculator, here is a currency translator, which allows you to enter or have the exchange rate of the euro countries, plus three customizable countries.